Circuit flying is very exciting and rewarding as you complete a full flight from take off to landing within 5 or 6 minutes. However, becoming proficient in the circuit takes time, patience and a lot of practice. 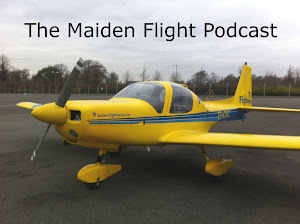 Join me as I talk about my first impressions of circuit flying and some of my highs and lows as I learn to land. Thanks Neil! Nice of you take the time to listen and comment! Hey Mark, thought I'd say hi as I've been enjoying the podcast for a while now. I'm currently a good few lessons behind you so it's fun to see what's right ahead and how you're getting on with it (although I know you're ahead of the podcast yourself). I'm an Irishman learning to fly in the Caribbean - one flight school, one plane, one instructor! Look forward to the next one. Gordon. Thanks so much for the comment. An Irishman flying in the Caribbean; you're living the dream man! I'm so jealous! I'm sure it's great flying weather most of the time, not like here :-) Please keep me updated as to how you're getting on...its nice to be able to share stories and experiences. Maybe you should start your own podcast "Aviators of the Caribbean"